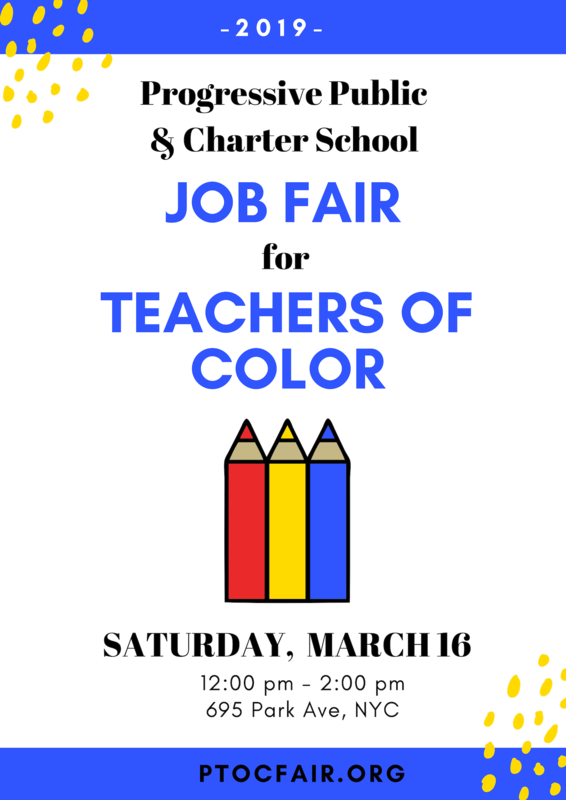 The 5th annual Progressive Public & Charter School Job Fair for Teachers of Color takes place March 16th and you're invited! Finding the right school can be hard - the goal of this job fair is to connect progressive educators of color with progressive schools that share their educational beliefs, values, and goals. Register today, and invite your friends! **Registration for teachers is encouraged, but not required. UPDATE: All Charter and Public School Tickets are sold out! Finding the right school can be hard - our goal is to connect progressive schools with diverse educators who share the same educational beliefs, values, and goals. The PTOC fair was co-founded by two classroom teachers in 2015, who recognized the need for more teachers of color in progressive schools in New York City, and who wanted to create a space where teachers could meet with both public and charter schools. It has quickly grown into one of the most well-attended teacher job fairs in New York City. We believe that education works best when teachers and schools are a good "match" for each other. The schools attending this fair tend to favor more responsive, progressive practices over the "no-excuses" model. Educators will be looking for schools with features such as: collaborative learning, a responsive curriculum with a heavy emphasis on social justice, holistic testing, project based learning, LGBTQ friendly policies, expeditionary learning, and Restorative Justice practices. Schools who feel their educational philosophy is a good fit for this job fair are invited to register. In order to maintain the intimate nature of the fair and to maintain our unique balance of public and charter schools, we limit the number of charter schools that can register. Additionally, we prioritize progressive independent schools that are not part of a large network and have fewer resources. If your school is part of a charter management organization or a charter network of any size, do not register without contacting us first for more detailed guidance. Whether you are a seasoned teacher or new educator, don't miss the opportunity to connect in-person with school leaders and representatives in a warm and welcoming environment. The event is free for job seekers, and is the only job fair where you can connect with both public and charter schools in the same space. Candidates who attend the job fair are much more likely to secure interviews than those who rely on emails and online applications. Register today, and help us spread the word! * Please note, the majority of positions available are for classroom teachers. Employer registration is closed. Please visit: https://tinyurl.com/y843lwor to be added to our mailing list for next year. Registration is optional for job seekers but highly recommended. This ticket is ONLY for job candidates. We will be raffling off free demo lesson coaching - bring your friends! This ticket is for mission-aligned organizations and private employers, not for schools or candidates. The goal of this fair is to connect progressive schools with diverse educators who share the same educational beliefs and values. Schools who feel their educational philosophy is a good match for this job fair are invited to register. The goal of this fair is to connect progressive schools with diverse educators who share the same educational beliefs and values. Schools who feel their educational philosophy is a good match for this job fair will be invited to register. The fair is very popular and our capacity is limited - please do not register without contacting us first, or your registration may be refunded. There are spaces for a total of 2 representatives per school. This ticket reserves space for your 2 representatives, so no need for multiple RSPVs. Each school will have a table with seating provided. Representatives should arrive no earlier than 20-30 minutes prior to the event. The goal of this fair is to connect progressive schools with diverse educators who share the same educational beliefs and values. Schools who feel their educational philosophy is a good match for this job fair are invited to register. There are spaces for a total of 2 representatives per school. This ticket reserves space for your 2 representatives, so no need for multiple RSPVs. Each school will have a table with seating provided. Representatives should arrive no earlier than 20-30 minutes prior to the event. The goal of this fair is to connect progressive schools with diverse educators who share the same educational beliefs and values. Schools who feel their educational philosophy is a good match for this job fair are invited to register. The fair is very popular and our capacity is limited - if your school is part of a charter management organization, do not register without contacting us first. There are spaces for a total of 2 representatives per school. This ticket reserves space for your 2 representatives, so no need for multiple RSPVs. Each school will have a table with seating provided. Representatives should arrive no earlier than 20-30 minutes prior to the event.